We love Matching Games. I have to admit that Bethany is a little too good at these games these days, and Mummy definitely doesn't have to let her win anymore...she just does it on her own. I blame baby brain ... I wonder how long I can continue to use that excuse? I first saw this idea of a fabric matching game on a stall at the craft market ,"Wheel 'n Weft", that's run a couple of times a year in Thornleigh, Sydney. They were completed by some very talented twin sister crafters known as The Twin Thing. 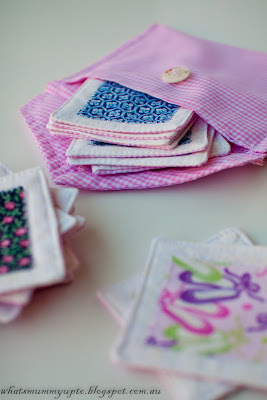 I loved the idea, and thought it would make a great project to use up some scrap fabrics. It's also really cute!! The game by The Twin Thing had small circles of fabric appliqued onto plain colour backgrounds, and a little matching draw-string bag to hold all of the pieces. UPDATE - If you'd like a set of these, but don't have the time to make them, I've now added a couple of sets to my Etsy shop for sale. Head over and take a look!! Otherwise feel free to use my tutorial below to make your own! - Time Taken: About 3-4 hours - cutting all the pieces is a little time-consuming, but kinda therapeutic! 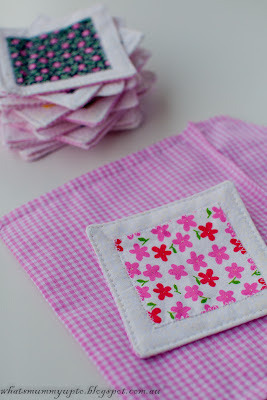 Tip: I used a rotary cutter, quilter's ruler and mat to cut all the pieces. - Pin the small squares onto the middle of the white background fabric, then using a small zig-zag stitch sew around each, trying to sew right at the edge of the square to make it look nice and neat. I lower the needle, then lift the machine foot to pivot at each corner, so that you have to stop less times, and have less threads to trim off. - Place the white background squares and backing fabric squares right side together, and sew around the edges using a 1/4 inch seam. Leave a small opening (about an inch) in the side of each square for turning through. 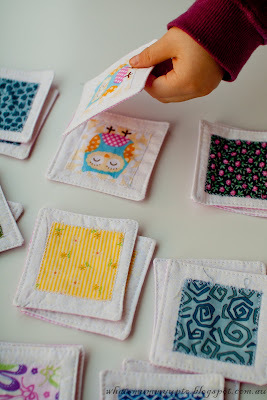 - Turn the squares through the right way (using the little hole you left in the seam). - Iron each square, being careful to fold in a 1/4 inch seam at each of the openings left from turning them through. - Topstitch around the edge (about 2-3mm from the edge) all around the squares. This just makes them sit better. Ta-da ... you have a matching game. Mine is definitely not perfect, but I think that's part of the charm! 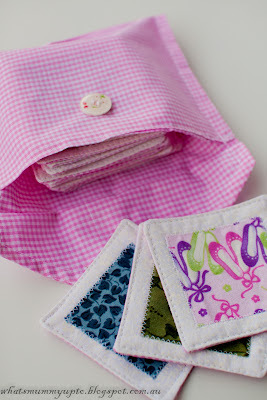 Now of course, any cute matching game needs a matching bag!! Mine is kinda like an envelope. - Put the two pieces right side together and sew using a 1/4 inch seam around 3 sides, leaving the bottom (straight) edge open for turning. - Turn through to bring the right sides out. - Iron the whole thing flat, then turn under and iron a 1/4 inch seam across the bottom that you left open for turning. - Top-stitch along the bottom. 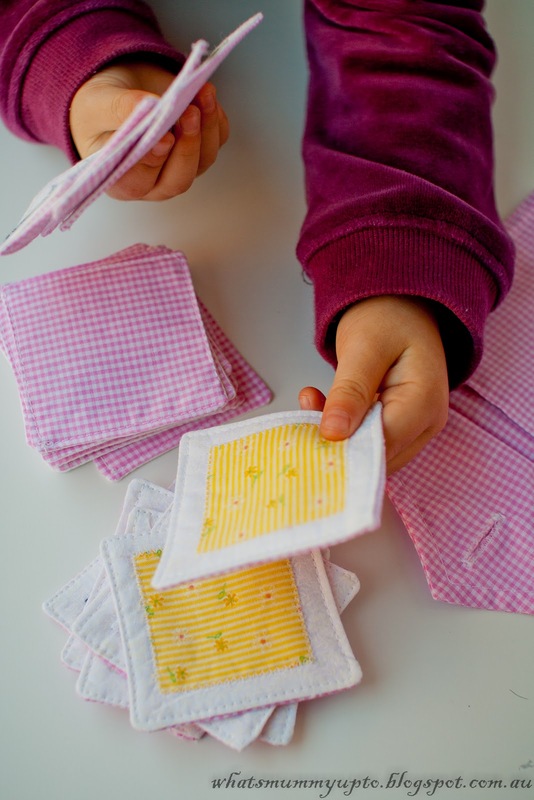 - Fold the bottom up to about 3 inches from the top point, then pin the sides to hold it together. - Start at the bottom on one side and top stitch 1/4 inch in from the edge. Go up the side, across the top via the point, and down the other side. This holds it all together in an envelope shape. 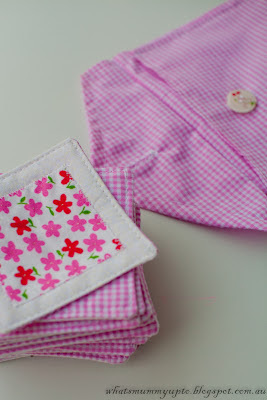 - Sew the button on the front. - Do up the button, then topstitch along the top edge, about 2mm in from the edge to help it sit better. I think it's gorgeous, and I reckon it's a fabulous gift idea for a kiddy friend! Mine is very girly looking with all that pink gingham, but I'm sure you could make an amazing boy version! Let me know if you have a go at making it...I'd love to see your pics!! Love this idea! And I have LOTS of scraps to try it with. Love it! I think I'll make a game for when the grandchildren come for a visit. Thanks for the tutorial. I work in a kindergarden and I will make a game for them to play with! What a wonderful idea! Thanks for your comments everyone!!... Julie, Bethany is 4, but she has been able to play matching games like this since she was about 2 1/2 or 3. It's really a pre-schooler's game I think!! If you make it, I'd love to see any pics!! Thanks! No immediate plans, but this is in the someday folder for sure. Sorry, what is the game exactly? Is it like "concentration?" Yep, exactly the same as concentration, just by a different name! 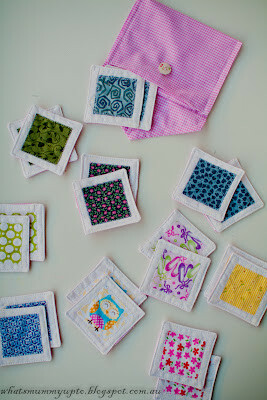 I have made these using leftover i spy squares and sewn them with batting. however, the part of yours that i like is the envelope. I will have to try that! thanks for a lovely tutorial. I love this game! Especially because I'm a pre school teacher and during internships the kids loved this kind of games! I think I will make them to add to my "Operation Christmas Child" shoeboxes. I love them. Oh, that's a fantastic idea. Our family does the shoeboxes each year too via our church, and these would be perfect for them ... thanks for the idea! Light-weight, unbreakable, and loads of fun for all age-groups! 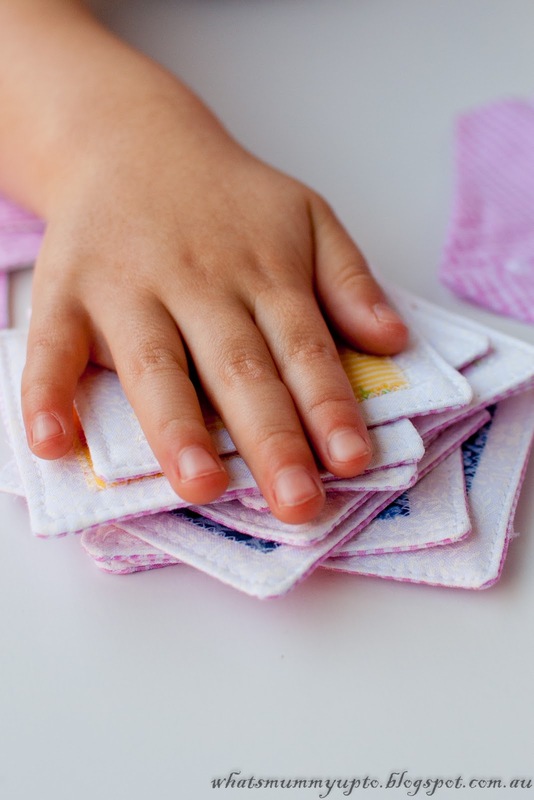 On the same topic, you may be interested in our Memory game based on Tangram patterns. I like that they are nice for little hands to hold. I made one of these. Kids loved them. Need to make a cloth bag to store them in. I LOVE this idea!!! Pinning it.... Thanks! When you've got no hair, you really need a hat!